On Sunday two sad things happened. Our beloved prophet and president of the LDS church, Gordon B. Hinckley, passed away. The other sad thing that happened is that I turned 30. Both events gave me mixed feelings. Our prophet has been such a wonderful influence to so many people and such a great leader for so long. I can't imagine not hearing his sweet voice in General Conference. He will be greatly missed. On the other hand, I know that he is in a far better place and reunited with his wife and those he loves. We had a sweet family home evening last night where we talked to our girls about our dear prophet and each one of us had tears in our eyes remembering him. As far as my birthday goes, yes it is a sad event. I guess I didn't expect to be so emotional about turning 30. I remember laughing at Brian when he was so sad about his 30th birthday two years ago. Now I understand. Doesn't getting older mean more maturity and the older you get the wiser you get right? Well, I don't feel any of that. All I can think of is that I am not in the coveted 20's anymore (boo hoo!). Despite my sad events, (and that I spent the evening in bed with a fever! Welcome to the 30's huh? ), it turned out to be a pretty good day. The night before Bri took me out to dinner at PF Changs, oh I mean Applebees (huge line at PF Changs), and then we went to a symphony. There is a cute girl in our ward, Ashley Gartside (Brian home teaches her family) who plays viola in the Maryland Youth Symphony. We loved going! It was such a fun birthday date. Raegan came with us (yes, we were the only ones in the theater with a baby) and she did a great job. 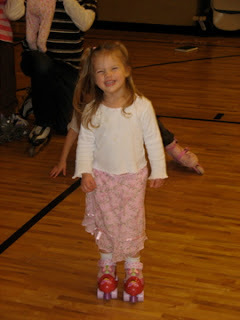 Oh, except one time when it was so so quiet and Raegan starting babbling and got a huge laugh from the audience. Ashley did wonderful and we were so glad we went. Sunday we had a birthday party, (where I finally got an electric fondue pot!!! Yay!) and my kids made me some fun games, and a great birthday crown. Then that night we went to a baptism preview for Teralyn (do a really have a girl old enough to get baptized????) and then I zonked out at 9:00. So, Brian and I have been trying a different form of discipline for the past week. We are hoping it will help with the kids' motivation to get their things done without us constantly nagging them. We found a few mason jars in our basement and I bought a whole bunch of stickers. They each got their own jar to decorate and put their name on. Then, we said that when they do their jobs without us asking and they do it happily, then they get some beans in their jar. Once their jar is full, then they get to go on a daddy daughter date (or a mommy daughter date, whichever one they choose). Anyway, last night we did something a little crazy for us and went bowling! We have tried this before but it was when I was about eight months pregnant and we went to the Columbia bowling alley. We were actually a little relieved when they said Friday nights were reserved for bowling leagues because it smelled of smoke and I felt a little out of place with my huge belly. 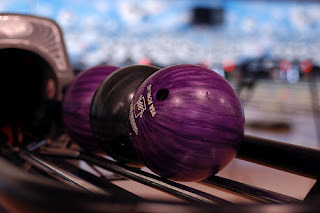 So this time, we thought we would try the Laurel bowling alley, and we had a blast! It was clean (no smoky smell), it was friendly, we quickly got a lane, the scoring was electronic (yes, it has been that long for us), and we didn't even feel out of place with our little babe. There was actually a little family right next to us with two little kids. So I have to say that the three times that I have been bowling with Brian, I always think I am going to beat him, but I never do! I don't know if it is my ego or what, but I guess I just need to admit to myself that he is better than me and then maybe next time I will beat him. We had two games and both times he wiped me out. Okay, so the first time the score was 126 to 85, and the second time the score was 125 to 108. As you can see, I'm getting better, watch out for next time Brian! One of our favorite parts of the night though was that the little family right next to us kept cheering us on! They were so friendly and Raegan even let the mom hold her! I was shocked! After our little games, we went outside to a little sandwich shop called, "Shane's". We shared a super steak submarine and some fries and it was so yummy! 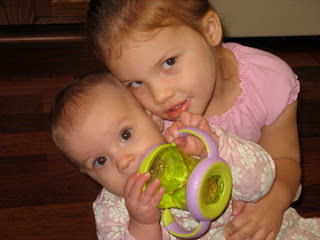 We then got our girls, put them to bed, and had our movie night. So, if you have any more good date ideas that we can do with a baby in tow, pass it on! So the past few weeks while our car has been getting fixed, we have been using a PT Cruiser for our rental car. When we first got it, we kind of cringed (we have always made comments about how much we don't like their looks...), and when Brian first drove it to work and I asked him how he liked it, he wasn't too happy about it. Well, as the time went on so did our opinion of the little car. Although I never did figure out how to manually turn on the dome light, there were some really cool features, for example, it tells you how many miles until you are out of gas (which is a huge benefit for me!). I actually learned to really like riding it. For some reason it felt like I was driving a little sports car. Although it looks pretty big, it felt really small. So, right when we were really getting used to the little thing, we get a call from the auto body shop saying our car is fixed. You know, I should be really excited about this, our car is finally fixed and looks as good as new, but I am actually pretty sad. 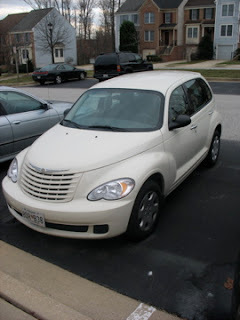 Now I don't get to drive a little sports car anymore (or at least in my mind a sports car), my kids aren't excited as much about my little shopping trips and now I can never make fun of the PT Cruiser again, because I actually liked it! Oh, another thing, I don't get to smell that new car smell. When we turned it in yesterday and got our Mitsubishi Gallant back, I laughed so hard (to myself that is) when Brian said, "I wonder how much PT Cruisers cost?". 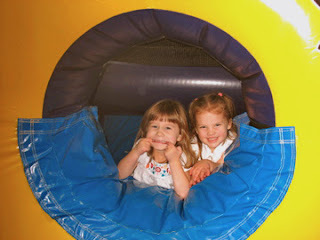 Yesterday Nicole Jensen and I and our four kids, went to Pump it Up in Columbia. We went to an open play time and for just fourteen bucks (you don't have to pay for adults or babes), we were able to get all of us in! We had a great time. I have never been there before, so I didn't really know what to expect, but I was impressed. 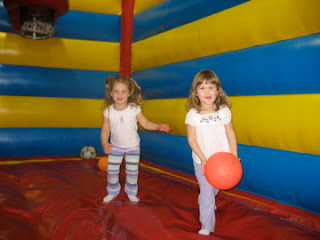 There was hardly anyone there and there were so many fun moon bounces for our kids to play on. We had a blast. For Christmas from my cute younger bro. and his wife, we got some really cool water bottles. We have already used them many times and we each got our own size and color. Even little Raegy got one. We put water in it for her and she sipped it and loved it! 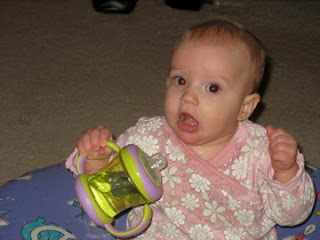 Yes, it was her first time using a cup or sippy so I had to get some pictures. Hope you enjoy. What older sibling doesn't LOVE to dress up the younger ones? 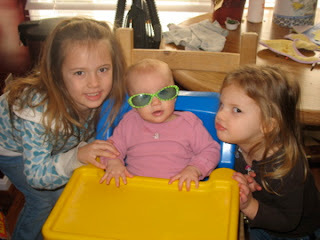 Ashtyn and Teralyn were enjoying torturing Raegan with the sunglasses. She actually didn't mind it at first.. So, last night I finished a great book. It's called, The Goose Girl by Shannon Hale. I loved it! Cami actually loaned it to me quite a while ago, and I just didn't get around to reading it until now. (I'm sorry Cami, I will finally return your book!) Anyway, I am so glad that she recommended it me. It was very light reading, but so much fun. Check it out if you get a chance. Yesterday Ashtyn refused to go to preschool. She told me when she woke up that she didn't want to go, and I just crossed my fingers that she would. When we got in, I tried to be excited, hoping it would rub off on her, but no go. She basically clung to my leg like it was the end of the world or something. her teachers tried their darndest to get her off my legs and into class, but she threatened a huge tantrum, so they gave up. After about fifteen minutes of this, I decided to not push it. I told her that we could go home, but when she got home, she needed to go take a nap on her bed. She said "no" of course, but I guess that she knew I meant business because she went straight up to her bed and laid down, pouting to herself. Well, after about an hour of not sleeping and pouting she asked me if she could go to preschool. It was too late by then so we just had a little chat about the reasons she doesn't like preschool. The only thing that I can think is the problem is that she doesn't have a lot of friends at school. She complains that the kids don't play with her (I'm sure she is not doing much to help). I am just a little frustrated and don't really know what to do.... Any advice will help. are onto the adventure of the ice rink. So far, so good. We have only had one lesson, but they are actually enjoying it and are excited about it. 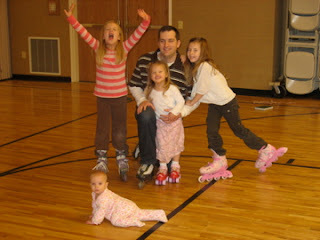 Who would have thought that I would have girls who actually liked to get on ice skates??? Okay, I admit, it has looked like so much fun watching them, that I am considering trying again. I will have to ask my girls a little technique on falling though so I don't break another arm. Okay, so we had our second annual New Years Eve bash for our kids. It started two years ago (last year it fell on a Sunday so we didn't do it) when our kids asked us why we got to go to parties during the holidays and they didn't. We thought about it and said, "well, why don't we throw you a New Years Eve party and you can invite your friends over?". 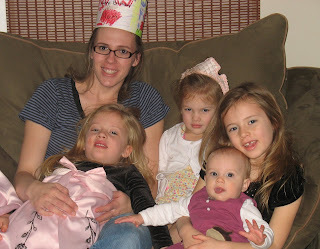 So, that year we had a total of eighteen kids in our house (while their parents went out) and we all had a blast. We had so much fun last time that we decided to do it again. Brian and I are not quite to the superhero status (although we are pretty close), nor do we have the house space that we would like, so we didn't invite ALL their friends like they wanted, but we did invite quite a few and we totalled nineteen kids in our house for three hours. Luckily, we had Dance Dance Revolution, so for the first hour Brian was able to do tournaments with the kids downstairs. I was just about ready to get the goody table set up, when I was bombarded with hungry kids. Turns out that I never did get the treat table set up, it was pretty much me handing out treats as fast as I could while the kids ran from DDR to the treats as fast as they could (to those whose kids came over, I'm sorry about the sugar high). After an hour, we turned on Meet the Robinsons and the kids calmed down for a little while to watch a movie. We grabbed our new game of Sorry, and set it up in the living room for those who got a little bored of the movie. It turned out great, the stragglers came up with Bri and I and we directed a fun little game and enjoyed ourselves immensely! We laughed at little Ethan Turpin because he definitely kept the game animated, especially when he drew an eleven (his favorite, so he says). The game and the movie ended simultaneously (I'm not sure how that worked out) and we loaded the kids up with hats, pots and pans, shoes and socks, coats, and of course noise makers (I know, you parents were happy about that one). We then ran down to our backyard and woke up all the neighbors. So, it was successful and we can't wait until next year!